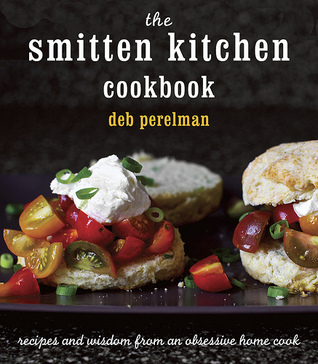 I have been following the smitten kitchen blog for years and have made several of Deb Perelman’s recipes, a few of which have become staples in our house—mushroom bourguignon, roast chicken with dijon sauce, lemony zucchini goat cheese pizza—and I can’t wait to dig in to even more here in the smitten kitchen cookbook, just released this week. It is about two-thirds savory, one-third sweets, and all of it looks absolutely delicious. Perelman has a warmth and familiarity in her communication, and a way of making you feel welcome in her world, as though you are another close friend. The full-color photos are gorgeous, and the layout of sections is cohesive. Her recipes are clear and surprisingly unfussy (considering she defines herself as being obsessive!). Well, Perelman has gone through all the fussy testing for her readers, so they may make these recipes with less hassle. However, most of the recipes are not for total beginners, and many take some time (but not too much time). Every one I have made so far have been totally worth it, though! 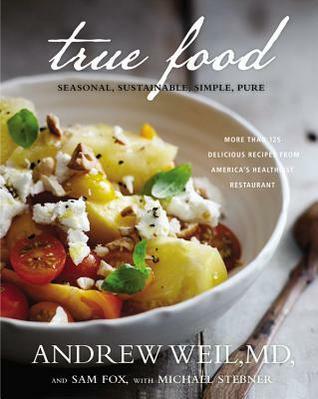 Also in the mail this week I received True Food: Seasonal, Sustainable, Simple, Pure by the owners/chef of True Food Kitchen restaurants in California, Arizona, and Colorado—Dr. Andrew Weil, Sam Fox, and Michael Stebner. I won this book as a free giveaway from Goodreads.com’s First Reads. I haven’t had a chance to make any of the recipes yet, but they all look very tasty, healthy, and relatively easy to make (thanks to easy-to-understand instructions). True Food‘s aim is for healthy lifestyles, and includes information about gluten-free, anti-inflammatory, vegan, and other unconventional diets that are coming to the forefront in the food industry lately. There are also great sections in the back with from-scratch recipes for things like teriyaki sauce, wok aromatics, etc. that you would probably normally buy in a jar. In my first impression, it looks like some ingredients called for in True Food you’d have to hunt down at specialty stores (miso and natural yeast flakes, for example), making those particular recipes a little tougher to pull off for a normal weeknight dinner. Also throughout the book you’ll find personal anecdotes from the three authors and tips for a healthier lifestyle through food. Not to mention, the photos and layout are beautiful as well! This entry was posted in books and tagged cooking, food, health by kristin @ my little heart melodies. Bookmark the permalink.